Bertie here. I’ve had a terrible time this week. Okay, we went out on the grass for a couple of hours earlier in the week, but then it all changed. One day I was down having floor time in the kitchen like normal, and I came back to find my cage had gone! The bottom part was empty, well with white pads lying all over it, and none of my things. Mummy put me in my loft – and the ramp had gone! There was a panel across the top where I usually stand and watch her. I found another ramp on the other side, but it was steeper and the wrong colour. I couldn’t bear to go down it. Besides, I didn’t know where it led. After a bit Mummy picked me up and put me down a level. Well, she tried to push me towards the ramp tunnel first, but I wasn’t having any of that. So she put me downstairs with Midge! Well, that was a surprise. I like teasing Midge. We chatted a bit, and he grumbled a bit about having me mess up his nice clean cage. We don’t usually have clean cages midweek. After a while I went back upstairs to have a snooze in my tent. Later Mummy came back so I came down again. She put Percy in my other run, the one she’d covered with white stuff. I didn’t see much of Percy. He hid in the zebra snugglesac, which smelled funny. Then Midge got all antsy about me being there, and told me off. And I told him off, because Mummy had given me the ramp so she must mean me to use it. And he said nobody asked him, and I said something else, and anyway we got into a bit of a fight. Mummy took me out and put me in my loft. She took the ramp away and put the other panel across. So I was all caged in and in a tiny run. I tell you, it’s mistreatment and somebody ought to pay for it! I went out on the kitchen floor the next morning. Percy didn’t come down. He was wobbling around my his cage like he was drunk or something. He spent most of his time in his zebra sac or his tartan tunnel. Mummy took him downstairs on his own a few times, well lots of times. She brought us up some nice things sometimes, grass and things called clover. I had another run on the kitchen floor that afternoon, too. That’s new. The next day (Friday) was much the same, but Percy was more himself, walking around better. He was eating hay and food too. I thought I might get his leftovers like we had the night before, but no. Saturday all went back to normal. Mummy cleaned both parts of my run out and put my proper ramp back. Percy went back to Midge. They bickered a lot. Midge was jealous that Percy had special treatment. Percy says it’s very painful and you have to eat horrid tasting foods. He’s still got his lump. You can see how big it is because his hair’s been cut off. There’s a funny line across the lump; it looks like it’s been joined together somehow. Percy says he’s had an operation but Dr Sally couldn’t get the lump out, so he’s keeping it. Well, if it’s his, why not? So all is back to normal, Percy’s keeping his lump, and Mummy says Percy’s hair will grow back pretty soon. It’s not very pretty, though. And I was only mistreated for three nights, shut up in a 2×2 cage. Mummy says I should think myself lucky, I might have had to go in the 100 cage on a floor somewhere without any of my things. That’s not nearly as nice. Percy seems all right to me. He hasn’t changed since Saturday. I’m sure we went out once this week. I can’t remember which day but it was a long time ago. Percy here, by the way. I’m afraid Bertie and I are both having trouble thinking of something new and interesting to tell you. It’s not that we have a boring life. It’s a very satisfying one, in nearly every respect. We look forward to grass time, which usually coincides with Mummy coming home. A couple of days this week she came home and said it was nearly dry enough to go out on the grass, and then it rained again. She even went out in the rain all day herself. She said it was for a competition. And then she was going to theatre in the evening. I’ve not discovered what theatre is yet. A couple of days and nights it was very windy. We heard one of the branches come off the tree outside. There was also a big thunderstorm which made the windows rattle, and little ice things banging against the window. Very noisy. We did go to see Dr Sally again this week, just me and Mummy. They talked about me as usual. Dr Sally looked at my lump and looked inside my mouth, and agreed with me that it isn’t related to my teeth. Mummy has noticed I sometimes get things stuck on that side and have to move my head around while I try to move it on with my tongue, but I usually manage after a couple of tries. They mostly talked about my ‘quality of life’ and whether having some slight discomfort was better than risking disability with an operation. Dr Sally is worried what she might find hiding in my jaw muscle. She says she’ll either sew it up again or take as much as she can out then sew it up. But because Mummy is so busy, and there’s no hurry, they set a date when Mummy will be able to take good care of me afterwards, even if I need feeding every two hours or something. That seems to be in a month’s time. Mummy gives me a little feed every morning now, and I have to say, it’s really nice. It improves my quality of life no end, because it’s very tasty. It’s Emeraid with Nutrimed, and it helps my well-being as well as giving me easily digestible nutrients. I read the labels. If I have to be fed every two hours with that I won’t object at all. Neville had his hair cut yesterday, just around his bottom to help him keep it clean. Mummy said he seems to have plenty of experience of hair trimming. Not like Dylan who couldn’t bear Mummy cutting his bottom hair. Neville looked very smart this morning. They are a nice couple of chaps. I like them, him and Roscoe. 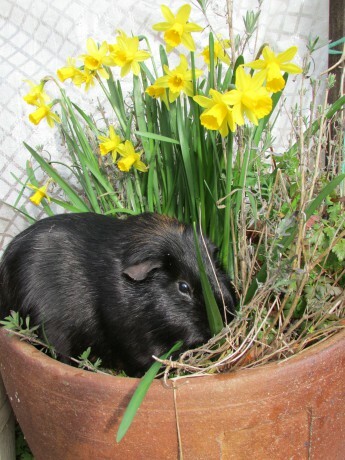 I suppose some guinea pigs might not go out in the garden much. Some may have to go out whether it’s raining or not. I don’t know. I only know that when Mummy’s home and it’s warm enough, and dry enough, we go out in the garden to eat the grass. She calls it lawn-mowing. This summer, Bertie has been in his own run, Oscar has been in his, and Midge, Biggles and I have been in the other – usually a much bigger one. Mummy says it’s because we have three times as much grass to get through than the others. I know it’s also because she likes it when we all run around together and are sociable. I like being sociable too. We socialise in the morning, on the floor in the kitchen, and we do that all year round. I like doing that, because it’s always the same temperature, and there’s hay in a box to jump in and munch. We (Midge and I) have been running around with Biggles, once he started being friendly and not aggressive to us. He’s a bit bossy, but nowhere near as bad as Bertie. Bertie and Biggles just attack each other, so Mummy makes sure they aren’t in the same place at the same time. Just recently, Bertie has been more sociable with me, after Mummy has taken Midge upstairs. Mummy noticed, so she’s giving us more time to get along. 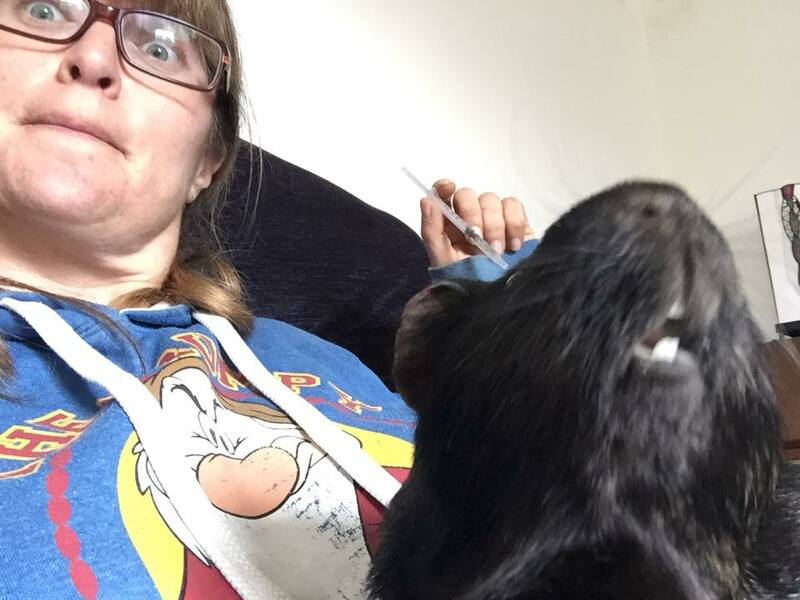 Bertie’s getting much better all round – he comes over to ask Mummy for a head scratch sometimes, which she likes doing. His nose is better now; those two black spots have disappeared. I think Mummy might put Bertie and me in a run on the grass together, to see how we get along. Midge can socialise with Biggles okay, although he’s not very patient with him. It’s funny, because they look very alike. Oscar and Midge and I went to see Dr Sally this week – Oscar and me for a check-up, and Midge because he’d set a new world record for heavyweight pigs. She checked him over and he’s fine. She checked us and we’re pretty much the same as we were although my lump’s got bigger. They decided that they’d give us a summer in the garden to see what Dr Sun and Dr Greengrass can do. It’s not as easy to ignore my lump as it was, but Mummy gives me something every day to make sure it doesn’t hurt, and I’m getting used to it. Dr Sally wants to see us again next month. That’s a date, then, Dr Sally!